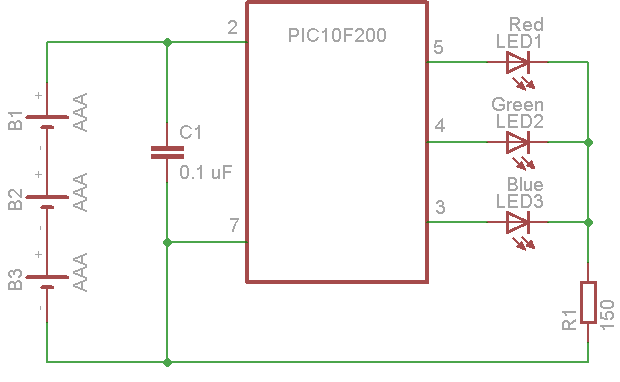 Here is a simple circuit using a PIC10F200. This is a low cost chip (38 cents / qty 100) that can be programmed with the PicKit 2 ($35). The on time can be easily changed from 1 to 255 milliseconds by editing line 43 of the source code. Golly, I'm so touched by how helpful this community is! Thank-you oPossum. Is this what you mean by a PicKit2? I'm so excited that this might work! That is a kit with the PicKit 2. The PicKit2 alone is here for a little less. A single RGB LED can be used if it is common cathode. The circuit and firmware could easily be modified for common anode if needed. You could also try a color changing RGB LED. It is too slow to appear white, by may look good in motion. You could use a PIC (I'm an AVR man, myself), or you could just steer clear of the whole situation and use 3 555 (or similar chip, or use the quad 555 chip, the 558) to drive a few transistors to drive the whole thing. Or, take a look at goodhart's forum about his led scanner thing, if he got that working, that would be a discrete way of doing it. My goodness guyfrom7up, that's such a kind offer! Take your time obviously, finish your exams, have a holiday, get around to it if it still interests you. I just finished what you guys call grad-school so I am sensitive to the needs of overworked students! If you can just work out how to make a Red-Green-Blue LED pulse super-fast (thus appearing white), that would be the ticket. It doesn't have to be adjustable or whatnot.